"... when OHMSS was released, it was immediately apparent that a serious error in casting had been made. First, Lazenby was simply too young for the part, his face suggesting none of the necessary Bondian world-weariness or ruthlessness. Secondly, his voice, despite the crash elocution course, was totally wrong, particularly when his underlying Australian accent broke through as it frequently did (an Australian James Bond was a contradiction in terms)... Thirdly, and most importantly, it was obvious that Lazenby lacked training as an actor. Putting it bluntly, his performance was both awkward and wooden, and whatever the certain "something" was that Hunt claimed he saw in him, failed to make the transition to the screen..."
Written only two years after the release of On Her Majesty's Secret Service, John Brosnan's comments about George Lazenby's performance were sadly echoed by many other writers and critics in the ensuing decade. The film was perceived as a critical and box-office failure for many years, and it was not until the emergence of Bond fandom in the early 1980s that its reputation began to soar. 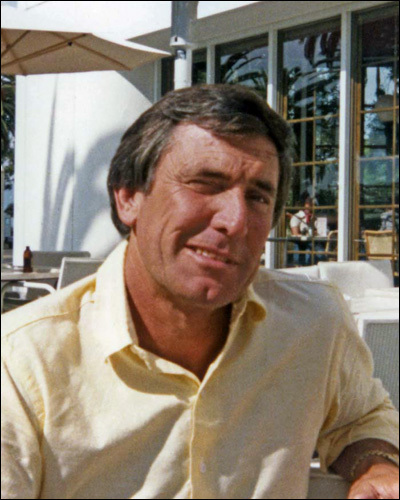 The following interview was conducted with George Lazenby in Los Angeles in October 1981. The interview by PAUL RIDDELL was originally published in 007 Issue #9 and 007 Issue #10 and features previously unseen photographs from the day. You were pretty young when you did OHMSS. Do you think your youth and inexperience affected the way your were treated by the Press after the film was released? Yes, I do. I think experience always affects the things you do when you look back in retrospect to anything you've done you always feel you could have handled it in a better way. I would have handled it totally different. I mean, it was a very different era - 1970. It was the hippies and the changing political scene, attitudes, whole lifestyles were changing, and the film industry was very flat. They were bringing out the wrong product. The public were more into gadgets and far-out plots at the time. Well, I think the public weren't really going to the movies at that stage; they were more into, you know, the hippie movement, into pop groups. The pop groups were very big then. I mean, The Beatles were bigger than Sean Connery for example. 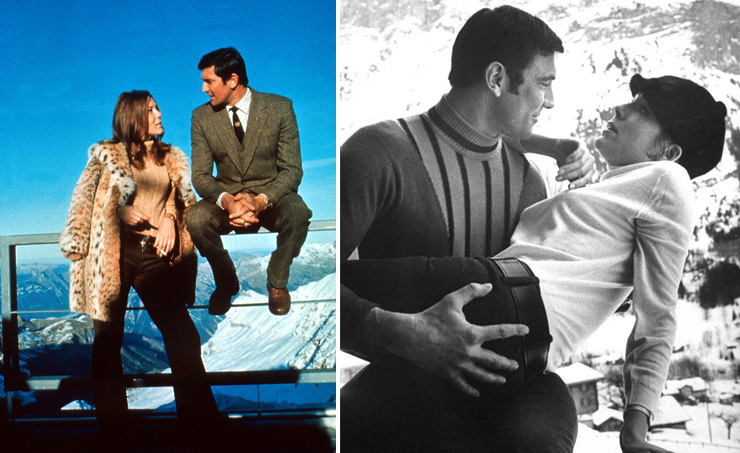 ABOVE (left) George Lazenby during the filming of On Her Majesty's Secret Service. (right) Director Peter Hunt flanked by producers Harry Saltzman and Albert R. 'Cubby' Broccoli. I read that Broccoli and Saltzman has the chance to direct a Beatles film but they turned it down. This was 1965. Well Broccoli and Saltzman never understood music. I offered to get them Blood, Sweat and Tears for the music in OHMSS and if you look up the records, in 1969 when the film was released, they had five hit records in the Top Ten. I had an underground tape with them before they even recorded, through my connections in the music industry. I said "what about this group for the Bond movie? ", and at the time it would have been right and they would have sold a lot of records - but as it was and turns out now, I prefer Louis Armstrong. Did you meet Louis Armstrong? No, I would love to have. A beautiful man. I have watched him on film, listened to his interviews, listened to his music and I had no idea they were going to get Louis Armstrong but they ended up with a great choice. Unfortunately, he didn't sell. When I hear the music now it brings back a little tingle. After signing an eight-picture contract with EON, why did you decide to bale out of the contract after just one film? For many reasons, but the main reason was I had a lot of people influencing me that Bond was finished; you were lucky to get the break to take over from Sean Connery but it you wanted to keep going as an actor you had to step away from Bond films and get into more youth orientated pictures such as Easy Rider. Now it's hard to go back and think in terms of that compared to Bond films now because they were a cult film. It was a different era and was a great thing at the time. That's where I believe that the movie industry had to go, had to change, and so I dropped out for that reason. I felt momentarily I would not be any worse off. Do you think that was the main reason why Broccoli made such a fracas about it - you being hard to get on with and all that? Well, you know, anyone who disagrees not to do anything is hard to get along with, and you say you don't want do something and the guy's offering you a million bucks, it doesn't figure in his head so he says your difficult. Now, I may be difficult but I felt I could pick up a million bucks in three movies even if I did spaghetti westerns. I was offered around 300,000 a movie in those days and I could knock them out in six months. ABOVE: A Fistful of Dollars? George Lazenby with stuntman Richard 'Dickie' Graydon (1922-2014) on location in Portugal during the filming of On Her Majesty's Secret Service (1969). Did you get a chance to play in a spaghetti western? Well, no. The bottom fell out of the film industry when I was available. In OHMSS were you able to contribute anything to the direction of it? Not really. I tried on several occasions - a bit hard to remember when or what I said. But you said you didn't speak to Director Peter Hunt throughout the whole film. Well, I spoke to him at the very beginning. Then we had a falling out over something, I can't remember what. Did you ever talk to John Glen? He is the Director of the new film. Was he alright to get on with? Yes, and a guy called Squire did some of the second unit. I got along with the crew really well. In fact, they were my greatest asset on the film. They were looking after me in a sense. The stunt men were helping me a lot, how to do my own stunts and not get killed! 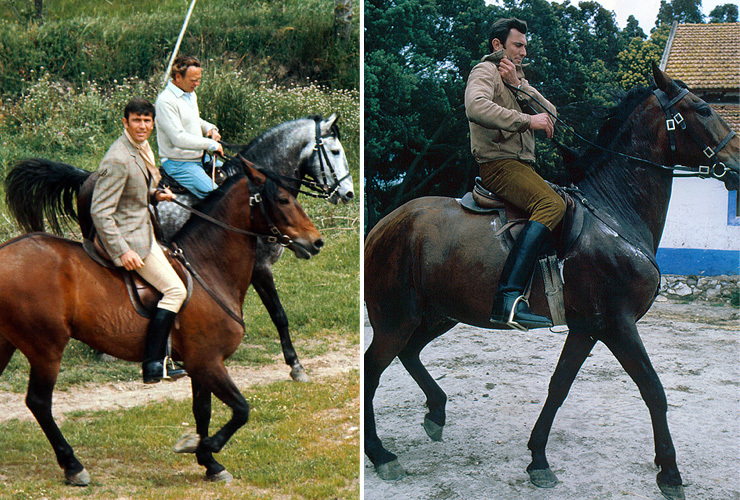 ABOVE: (left) George Lazenby with John Glen the, second unit director and editor of On Her Majesty's Secret Service (1969). Glen would later direct five James Bond films in the 1980s starring Roger Moore and Timothy Dalton. (right) Lazenby with co-star Diana Rigg and stunt driver Erich Glavitza. The stock car sequence in On Her Majesty's Secret Service was directed by Anthony Squire, who had also worked as a second unit director on Casino Royale (1967). Did you show them anything? No! Those guys have been around a lot longer than I had been around movies. Everything's artificial on movies. You have been compared more closely with the book version of Bond. Did you feel close to the character when you read ON HER MAJESTY'S SECRET SERVICE for the first time? The main similarity I have got with Bond is that I'm a loner. Now, I know a lot of people, but I don't hang around with anybody. I don't need any crutches as it were. You don't need people to push you along? Yes, I don't need to go and get geed up by anybody. I can go and do my own thing by myself and be quite happy, without anyone knowing I've done it. I don't need to tell anyone I've done it either. You are so close in looks to the Bond character in the book. Do you agree? No. But I guess that influenced my getting the part from their point of view. Would you be willing to step into the role of Bond again if the chance came up and you had the time? I have got the time, nothing to do with the time: Well, I suppose it does have something to do with the time - it takes a long time to make a Bond movie. I could handle it a lot better now. It would be no problem to me. I mean, I wouldn't have the stresses I had. I know now how to get along with people on a film set. I know how to remember my lines easier! Did you have a lot of problems in OHMSS with it? Well, not a lot of problems but the stresses were there. You know, you give me more than three lines... and I would really have to concentrate on what I was doing. I can't relax and act, you know what I mean? Now the lines just fall on top of what I am doing. They are no big deal. It comes naturally. I could have a lot more fun with the guy because I let more through, where before it was a lot stiffer. Would you approach the Bond character any differently than the first time? No, except I would just be looser. More would come through my eyes and through my body, that's all. Because there's more happening now. There's very little happening with me in the Bond role except for certain scenes where I had them totally worked out, I knew what was going on like the last scene. Most of the time I didn't know what was going on so there weren't too many thoughts passing through the old brain box. It was very staid, stiff and I would say that other actors go through life like that - but I don't want to mention any names. There's a lot of actors I can't watch because they are not moving. They are just doing: they are like dummies, and that's like I was with most of the Bond films. Do you mean like Roger Moore? No, I am not talking about Roger Moore. You can see them in television shows. They are like dolls taken out of a shop. I can't watch those television series. You've got to feel like you are looking through a keyhole with an actor, through a door, and him letting everything happen for you in the way it will happen in reality. I thought that Connery really got into the role though. Connery I can watch. Now he's an interesting actor. He had to watch the film lots and lots of times and probably got into the character more than anyone. Yeah, I like watching Connery work. There's a lot of actors who I don't like but they are very well-known and respected actors. I mean, how did I get there, you know, I should not have been there as an actor. That's unfortunate. I was watching Merv Griffin yesterday and there's a black guy who was a basketball player and who is a big star on a TV series, yet there's 30,000 actors in this town out of work. Why don't they give these guys a shot? It's not fair. There's some real rubbish on television. Total rubbish. If you think it is otherwise you are only going to be kicking yourself. You have got to be fighting yourself all the way through. You go in and people do television to earn the money. A few guys try hard to make something out of it, but most of the time they are working with people who have sold out. You know, they are doing it for the money. They are doing what they're told, they are not doing it as an artist. They are not being their true selves. We have heard remarks about the 'garlic' incident between Diana Rigg and yourself. Is this true? That was another Press thing that blew up in Pinewood. In the Commisary we were having lunch just before the love scene, and there were a lot of Press around because they were invited that day for the love scene. Diana Rigg was having lunch about four or five tables away and she yelled quite loudly "I'm having garlic today George, I hope you are". You know, it was just a joke. They took it down as if she ate garlic so she could put me off, but I don't quite remember smelling garlic on her, and it was quite a lot of fun with her and she's another bright lady. Did you get along well with Diana Rigg? Up to a point, but I don't like bossy women, period. I don't like bossy people, period - and in fact, I don't like people who are selfish. When you are with somebody else there are now two people taking up that space and you have got to think of the other person. Most actors I have known are not like that, they are pretty selfish. Did you find that Diana Rigg thought of herself as the star? Of course she did. Although I felt I was more than she. Your name was in the same writing as the rest of the cast. I will tell you another thing. Telly Savalas thought he was the star! How was he to get on with? He was OK - I didn't fall in love with him if that's what you mean. His lifestyle is completely the opposite to the way I lived. So I mean, we could get along - talk, act, laugh and joke together. Did he help you in the way you acted in the film? The only thing I remember coming from Telly that did help me as - we rehearsed the scene, our first scene together (I forget where it was but it was up on that mountain) and apparently they had forewarned him that I was a novice actor and he turned around in front of me and said: "He doesn't need any help. I've got to watch out, he will blow me off the screen". So that was in a way a compliment, because I came out remembering all my lines and Telly hadn't had his down yet, although he did by the time we started to shoot, and I had to have mine down because if I didn't there was no way I could remember them in five minutes like he can. He had been acting a lot longer than I had. Just that remark gave me confidence. Did you find having experienced actors next to you helped you even more? Oh, you have to have. You know, if I did not have experienced actors then I would have no bearing to work on. I would just be as bad as the worst one there, while trying to be as good as the best one there. It is the same again if you play a good tennis player - your game improves but you are not as good as they are and acting is very similar to playing tennis anyway. I don't care what they say. Broccoli stated recently that he thought OHMSS was a very good film. What do you think, and why do you feel it has developed such a cult following in the last few years? Well, two reasons are pretty obvious. It is the only film that I know of that sticks to the book, and secondly the only one that had me in it. You know they don't have two shots at this guy. Then only the face. It's now you see him, now you don't. When they don't read the critics which most people don't, they go in with open minds and like it. It's funny that nowadays some of the critics love it (in England anyway). It had some of the highest ratings on C.B.S. The thing is I can't get a job with C.B.S. There's not one flaw through the whole film (well maybe one). Take a Connery Bond you can spot the flaws. It was so well done. Probably because of Peter Hunt. It has nothing to do with me in that sense. The flaws would have been there if Hunt hadn't covered them up. The guy had worked out how to put it together. I'll give him credit for that, you've got to pay dues where its worth. I'd work with Peter again, I would. It does not matter if you speak with him or not. You see he knows what he is doing before he starts. I've never been the sort of person to have an argument and hold a grudge. My life is too short. If you've got a grudge, do this, belt it out and get it over with (and many people hate me for this) because I might hit a few people in the process, but the next day, you start life again. I can't punch a guy, then put my boot into him. I don't attack someone to the bitter end, and that's why I have no grudge against Broccoli, because really he was only reacting naturally, to what I was doing to him. ABOVE: (left) George Lazenby with director Peter Hunt - despite claims of not speaking the two appear to be communicating whilst shooting scenes at Piz Gloria. (right) Between takes Lazenby and producer Albert R. Broccoli take part in curling on the ice at Piz Gloria.